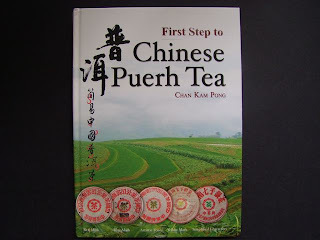 Cloud, or Mr Chan Kam Pong had written a book in English "first step to chinese puerh tea". 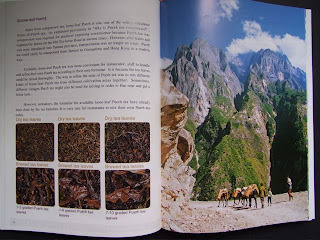 Beautifully lavished with many photographs, Chan deals with the history, manufacture, technical knowledge, storage and classification of pu erh tea. I enjoyed reading the book and highly recommend to anyone who is interested in this tea. 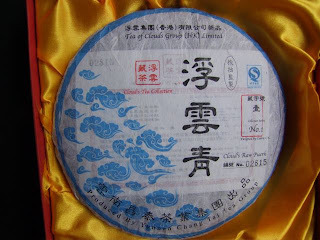 In addition, Chan has also produced puerh tea under his flagship Cloud Tea. He has produced 2 series, both raw puerh and are unique in that the puerh cake is composed of puerh tea leaves from different plantations of puerh. The series 2 puerh is from the "tea leaves of Mengsong, Bulang, Mengzhe, Naka, Mannong and Manmai". Not all tea shops carry Cloud tea. I had to write to their web site and was directed to a tea shop called Sin Fook Tea House in Kowloon City. It was a 10-15 minute taxi ride from Jordan, and the shop is located in the suburbs of Kowloon. The owner of the tea house Mr Ming was extremely friendly and hospitable letting me sample some of his tea in his shop. I left his shop happily with my purchase of the puerh book and a few cloud pu erh cakes. The book is a signed copy by the author, Mr Chan. I could not resist eating 2 bowls of braised beef noodles at a shop across the tea house and I also purchased a plain white gaiwan tea set for HK$20 from a porcelain shop along the street before ending my tea adventure for the afternoon. Hong Kong is one of my favourite places to visit. There are so many things to eat, shop and do. There are great food in restaurants, small shops and at open air street markets. One interesting observation is that there are so many 24-hr convenient stalls like 7-11 and k-mart that you may locate them so easily like an outlet every 50 metres apart. When you sit yourself at a restaurant for your meal or dim sum, you will be served chinese tea and you have a choice of jasmine (pronounced in cantonese as "heong ping"), chrysanthemum ("coke fa"), pu erh ("poh lay") or chrysanthemum & pu erh ("coke poh"). 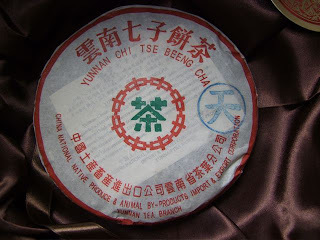 The pu erh tea for the above 2 choices is the ripe pu erh. You will in a few minutes served with 2 large teapots and a large empty bowl. One pot is your tea and the other pot is just hot water. The pot of hot water is not for you to make further infusions of tea but to wash your eating utensils like chopsticks, teacup, spoon and plate before the food is served. The large empty bowl is where you placed the discarded hot water. Enjoy your food and tea. If you need more tea in your pot, just turn the lid of the teapot upside down and your tea will be refilled. My favorite eating spots are actually in small shops found on the ground floors along rows of shops. You can easily locate one by simply looking at their shop front. Its common to see steaming large pots of braised beef or roasted ducks or chickens hung by necks in a glass display shop front. These shops found all over Hong Kong, to me, is the essence of the food culture there. Here you can savour the porridge (called congee or in cantonese "choke"), yellow noodles, rice noodles, or steaming hot rice accompanied by your choice or roasted meats. Pamper yourself by adding another dish of vegetables or soup. Such a meal will usually not exceed HK$40 (US$6) per person. Tipping is not required and these shops opened late into the night. One more thing, you are normally given a glass of tea when you order your meal. The tea is normally served in a plastic cup and is red tea. One of my Hong Kong friends claimed its diluted pu erh. I have however noticed that some locals do not consume the tea. These shops sell other teas, popular with locals, like iced lemon tea or sweetened milk red tea (hot called "nai cha yeet" or cold " nai cha tone". Buying tea or visiting tea shops in Hong Kong would be another must-do activity for me. At most tea shops, the prices are clearly stated and the prices are fixed. Smaller shops may give a 10% discount. Ask if you are unsure. One place to go tea shopping is Yue Hwa department store. They have several outlets in Hong Kong but I am recommending their main department store at Jordan. Located at 301 Nathan Road, it is easy to locate and the Jordan train stop have directional signs pointing to the store. The Jordan outlet has several floors of China made products like medicine, clothing, musical instruments, sculptures, jewellery, porcelain and much more. AND......there is on the 5th floor, AN ENTIRE FLOOR dedicated to chinese tea. You have the opportunity to try and sample the tea before you try. I was there in dec '08 and a 2003 CNNP ripe pu erh was on offer for hk$100 (about us$14) - see attached pix. I bought 2 pieces of the CNNP and also succumbed to the temptation of buying 4 Menghai pu erh cakes. Yes, they have other teas and tea accessories for sale. eh.....bought a teapot too. This must-visit store opens from 10am to 10pm daily. I liked this shop as the famous temple street night market is just 2 streets (blocks) away giving me more excuses to shop and eat. Ying Kee tea house is another place I would recommend to purchase good quality tea. They have been in this business since 1881. Ying Kee has more than 10 outlets in Hong Kong including 2 stores in Japan. They also have an outlet at the airport which gives me ample time to shop and do the last minute purchase of tea before I leave the country. One must buy tea for me is the "Golden crown teh kuan yin". This is a premium variety of Anxi province oolong tea. I enjoy this grade of teh guan yin as the taste and aroma of the tea leaves is really outstanding. Moreover, it has a pleasant aftertaste after drinking unlike other Anxi grades (which I have tasted) which have a slight sour aftertaste. The aroma is so strong that the teapot continues to carry the fragrance after washing. It is therefore recommended that you use a teapot specially dedicated to oolongs as using the teapot for other teas will affect the fragrance and taste of the non oolong teas. Prices of tea sold there is fixed and the same at all outlets. I purchased 150 gms of the tea for HK$240 (us$32) in dec '08. If time permits, do visit Flagstaff Museum of tea ware located in Central, Hongkong, in Hong Kong park itself. Admission is free and you can attend a free class but you have to book on the internet. You can also have tea (premium grade) there and be served in a very classy environment. Each purchase of tea can make a pot of tea with enough tea left over to take home as a souvenir. Another place is Luk Yu tea house also in Central. An excerpt from Frommers, a travel guide describe "Luk Yu, first opened in 1933, is the most famous teahouse remaining in Hong Kong. In fact, unless you have a time machine, you can't get any closer to old Hong Kong than this wonderful Art Deco-era Cantonese restaurant, with its ceiling fans, spittoons, individual wooden booths for couples, marble tabletops, wood paneling, and stained-glass windows. It's also one of the best places to try a few Chinese teas, including bo lai (a fermented black tea, which is the most common tea in Hong Kong; also spelled bo lay), jasmine, lung ching (a green tea), and sui sin (narcissus or daffodil)."